Rib-cage and backbone. Outline artwork of a female figure showing a frontal (anterior) view of the rib-cage and the vertebrae. The front ribs have been removed to show the backbone (vertebral column). The parts of the spine shown here are the seven cervical (neck) vertebrae and the twelve thoracic (chest) vertebrae. The first rib and the clavicle (collar bone) are labelled. 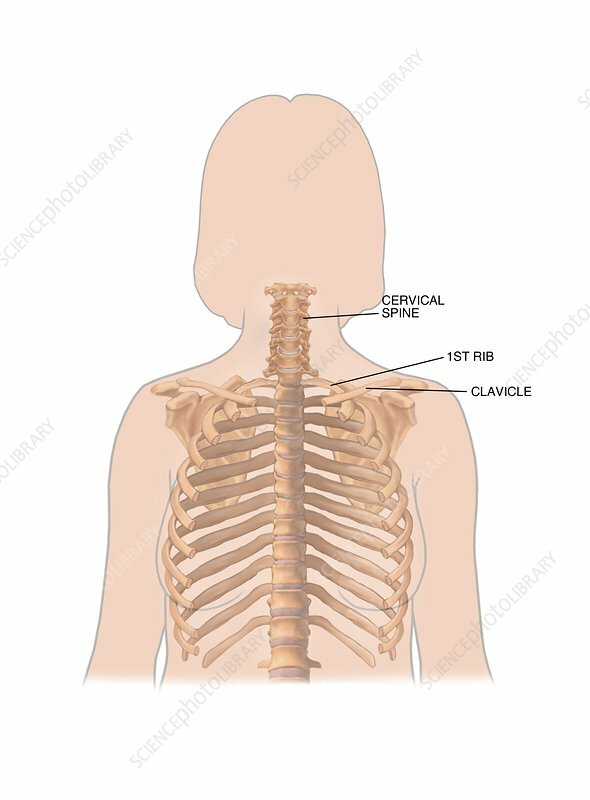 There are twelve sets of ribs, attached to the thoracic vertebrae at the rear and to the sternum (also removed) at the front. On each side, forming part of the shoulders, is a scapula (shoulder blade).